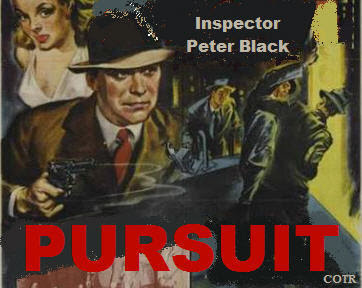 PURSUIT (CBS 1949 - 1952) was a detective series that presented the cases of the fictional Scotland Yard Inspector Peter Black. (The leading character was called Inspector Harvey in the audition show and the first episode.) The Inspector was a dedicated policeman, a man hunter, who once on the case, would not rest until the wrongdoer was brought to justice. Black was assisted in cases by Sgt. Moffet. The series was unusual in that it featured dual narration. Starting in the Spring of 1950, Bill Johnstone provided the opening and closing narrations and sometimes, bridges between commercials. Inspector Black furnished the change of scenes and overall case narrations. the relentless, dangerous pursuit. . When man hunts man!" The text log for PURSUIT is out-of-date and is longer being maintained. A PDF version of the PURSUIT log by Stewart Wright is UP-TO-DATE and includes listings of more AVAILABLE shows.